Valentine’s Day is all about love and one of the ways we can show love to our husbands and families is to bless our home. Sweet treats and pretty decorations make a cheery and peaceful place to spend time together. Most of all, however, our attitudes toward our husband and family will set the tone for every day of the year. If Mama ain’t happy, ain’t nobody happy. So be happy! What blesses your husband?? FIND OUT! Our first Valentine’s Day as a married couple was also the first time I tried my hand at crafting something for my husband. Keep in mind I was 19 and from the original mismatched-fluorescent-socks generation. I spent hours and hours creating puffy painted underwear for his gift. I’m not kidding. Before I go on, my husband wants me to make sure and point out that he has NEVER WORN THEM. He’s never even considered wearing them. Ever. In fact, he didn’t even remember them until I got his okay for this article and reminded him. I really wanted to include a picture here but they’ve mysteriously disappeared! Since that time, I’ve learned that what I think will bless him is not always what will really do the trick. I need to communicate with him and find out what it is. Then I need to do it. Yummy Treats: Christmas isn’t the only time for gingerbread. In fact, in our family I often wait until Valentine’s Day to make these super-soft and sweet treats. My mom and I came up with this recipe over the phone way back—six kids ago, I think—and it’s always a hit with my husband. It’s a special tradition to make these for him and the kids. They look forward to them. When I make these, I only make heart-shaped cookies and I frost them with store-bought cream cheese frosting. You can find the recipe on my blog: Soft Gingerbread Cookies. Keep a Beautiful Home: My husband doesn’t mind so much what style of decor I use in our home—in fact, he says it’s my domain so it should reflect my personality. He does, however, desire that it be tidy (as tidy as you can get with nine little kiddos) and comfortable. To me, comfortable equals beautiful so I’m always coming up with some new decoration or vintage find to accent our home. Sometimes it takes him a few days (weeks…) to discover it but he always compliments me on what I’ve done and that blesses me too! Valentine’s Day is definitely about hearts and flowers—but not everything has to be red. 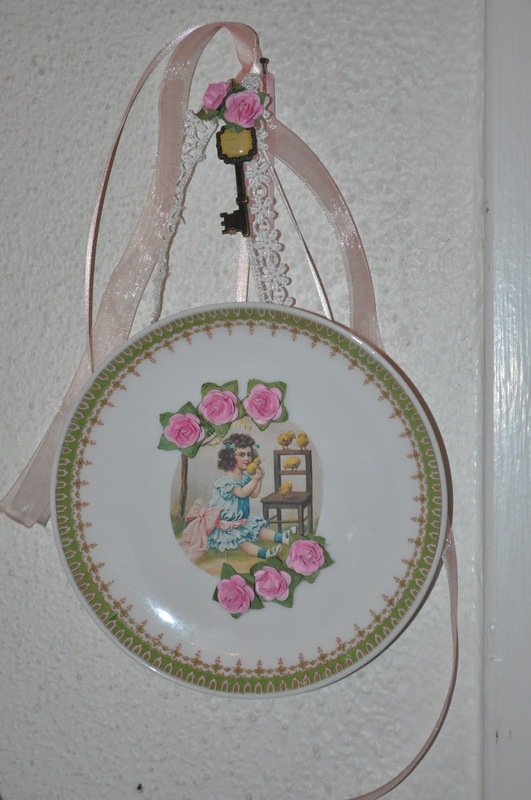 For me, Victorian or cottage-style patterns and pastels set a romantic scene. Here are some quick, cute and inexpensive crafts you can do to add a beautiful touch to your home this Valentine’s Day. 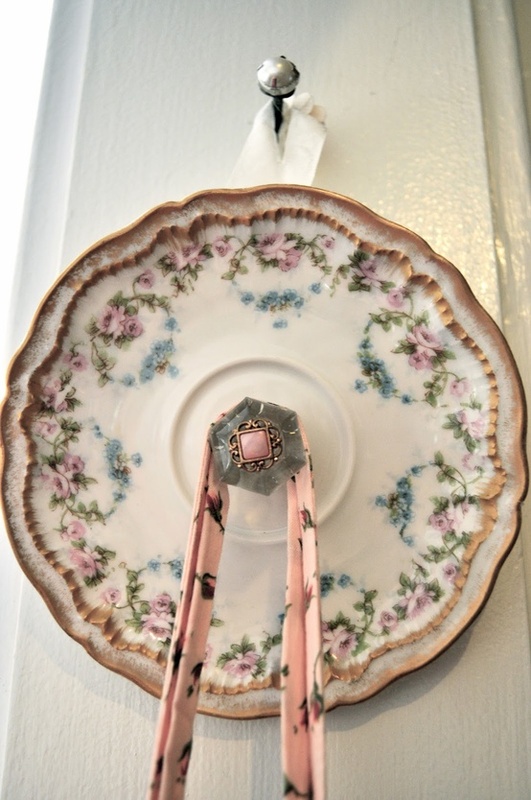 Each of them feature an antique saucer—easily found at thrift shops and estate sales. If you use a hot glue gun to put these together, you can usually peel the glue off later and reuse your saucer. 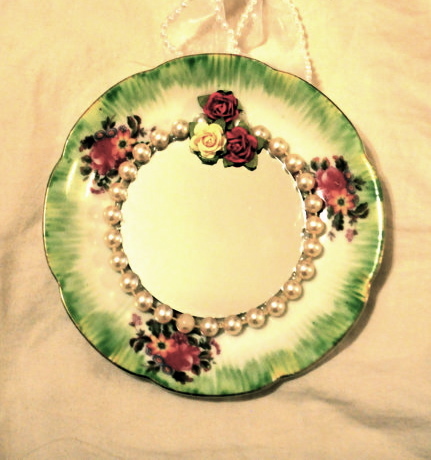 My “saucer decorations” originally started with this pretty saucer mirror that a friend sent me in a swap. She just used hot glue to adhere gems and flowers to the front and a ribbon/lace hanger to the back. This takes minutes and it’s the cutest gift idea! Here’s the one I made and put up for sale in my Etsy shop. I love green and pink together. These little round mirrors can be found at most craft stores for just a couple dollars. I found mine at Michaels. I used an old 1980s strand of faux pearls to go around the mirror and paper flowers from Walmart. These little mirrors would be cute to group together on a wall somewhere. 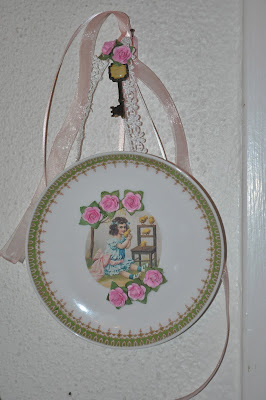 Another idea is to place a picture or photo in the middle of the plate. I made this as a springtime gift for a friend. I’ve thought about putting old photos of my grandma’s in these and displaying them instead of picture frames. I use a Fiskars circle cutter to cut the picture out but you could trace around a glass or something else round to make sure your picture turns out how you’d like. This plate became an apron hanger in a matter of minutes. I used an antique glass drawer pull and stuck a little embellishment on the end. I even put a little pearly embellishment on the head of the nail I used to hang it! a kind tone of voice, and a heart willing to bless him. My husband desires these things above all else. Today I encourage you to communicate with your husband, find out what really does bless him, and find creative ways to make it happen. It’s true that when we bless others, we are blessed as well! 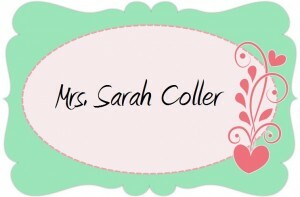 Mrs. Sarah Coller, your post was a blessing on Misty’s blog!!! Was one of those you in the picture? Your plates are so beautiful. I loved your idea of asking our husband what HE would like. Thanks for linking up over at WholeHearted Home this week. Sarah, I too am from the neon and puffed paint era. I laughed out loud at that part. I puffy painted shoes, t-shirts, jeans, numerous cards… pretty much anything I could think of. Usually with hot pink. What a style! Wonderful post. My Hubs is not a fan of too much in the way of actual gifts so I try to keep my attitude one of lovingkindness and our house a place of comfort and coziness. He tells me he loves that! What a beautiful blog!! I stopped by from Company Girl. You are so right…my attitude does set the tone for the day for my man. That is why it is so important for me to get alone with the Lord first thing in the morning. Blessings to you and your family. Thank you for your kind words Our attitude can make or break the day that’s for sure. Thanks for stoppin by! Blessings! I love the little mirror. Super cute! Isn’t it adorable?! Thanks for stoppin by! Blessings!